Enrica (not her real name) uses Amber House’s drop-in centre. 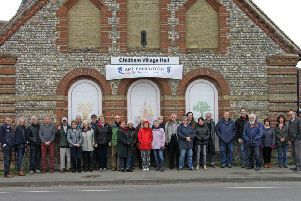 The New Road refuge in Littlehampton is the first public refuge in the country. Click here to find out more about Amber House. She has been married for over two decades – but claimed that even at the beginning of her relationship, she knew that something was not right. Having suffered physical abuse in a previous relationship, she said she thought she knew the signs. But her husband’s emotional, financial and sexual manipulation was something else entirely. She said: “It has been a slow chipping away effect on my identity and personality, small things like ‘you overthink everything’ and ‘you are just tired’, ‘have another drink’; minimising all my feelings and emotions. The catalyst was when he forced her to return to work days after a medical procedure, she said. Having won her own parents over to his way of thinking and wanting to protect her children, Enrica felt she had nowhere to turn, so she searched for help on Google. This was the first time she heard about Safe in Sussex and Amber House. She first visited the drop-in centre late last year and staff soon confirmed she was in an abusive relationship. With the help of the team, she managed to get a court order against her partner. Her next goals are getting a divorce, a better job and eventually studying psychology at university. She said: “I love Safe in Sussex. I’m a complete advocate; it is all I think about. Her advice to other woman in her situation? “If you think you are going crazy, you probably are not,” she said. To donate to Safe in Sussex, visit their website.